We've all seen the HGTV home renovation shows and flicked through Elle Decor with picture perfect living rooms and clutter-free kitchens, and thought to ourselves I would love to live there, if only I had the money, time, or design help. Whilst viewing these perfect images, it's not easy to imagine your dream family space when faced with an outdated home that really doesn't match your vibrant persona or lifestyle. 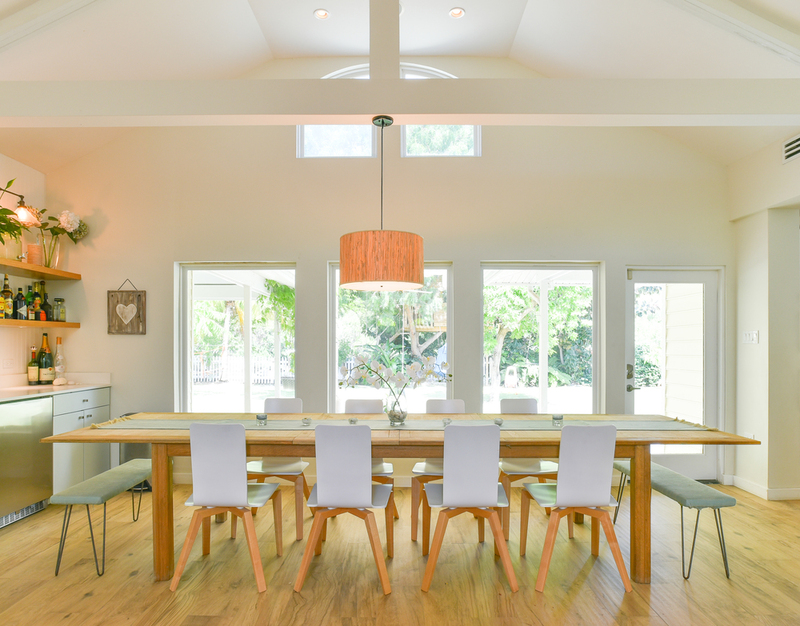 If you've never renovated a home or had any previous experience in redesigning or restyling a space, it can be difficult to see anything else but the fixed structure and existing use that lies before you. But those who have the vision and the guts to just go for it, really do reap the rewards. And that's exactly what the Loxtons have achieved. "We did own land at Patrick’s Island so building a home had always been our original plan. However, when we had our daughter we were living in a 900 sq ft condo and needed more space pretty quickly. We came across this house and fell in love immediately. It had enormous character and the most beautiful mature garden. And the extension and renovation potential was so clear. The house fit with our budget at the time and gave us plenty of room for a family of three." The Loxtons purchased their canal-front family home in 2010 and enjoyed living in their first Cayman property for three years before deciding to bite the bullet and undergo a major renovation. Think strangers in hard hats and a dusty demolition site, expensive architects modelling and remodelling and the inevitable delayed planning approval for a double-story extension. "It better be worth it" they thought. "It was so hard to imagine the finished article when we were designing our home because it all changed so much." Georgie explains. And I think there is a great deal of truth in this statement. From the beginning to the end of a finished renovation project, there will be many twists and turns as the paper design materialises into reality. The process of creating good design is about working with the design changes to best suit your lifestyle and existing space. The plans that you start with may be very different to the ultimate end product, but having an open mind and flexible attitude could allow you to create something much more exciting than you could have ever imagined, as Georgie exudes, "I love the finished home and still find it hard to believe the transformation." Many design magazines and blogs do not like to share the unglamorous "before" shots as they don't make for good imagery - something we were told first hand when our own renovation feature was in the lovely Inside Out Magazine. But for me, the tale of taking a property from its raw, basic and untouched starting point to the finished, customised and glamorous ending is a huge part of the beauty and success of a home renovation. How can you appreciate how much you've achieved if you don't reflect on where you started? The purpose behind LUSTIC LIFE is the journey of renovating, building and creating a dream life in whatever shape it comes and that is as much about the process as it is about the shiny, snazzy finished product. The Loxton's home was a Caymanian-style family home, all on one level with a beautiful pitched roof creating some great bones to work with. However, the use of space and enclosed areas didn't suit the family's lifestyle of entertaining and Caribbean living. They lusted for more open-plan living and better flow from indoor to outdoor space. The dark, wooden kitchen was enclosed and somewhat separated from the dining room, creating a narrower and more confined entertaining space. The entranceway and living room was separated from the dinning room, blocking off the gorgeous view of the mature garden space that the Loxton's loved so much. For a growing family who likes to entertain, extending their one level home to create a two storey extension was a well thought-out investment. By building up, the Loxtons created a stunning, modern kitchen, snug dining area, kids room and handy pantry under the stairs. "It is my dream kitchen – I can cook whilst watching the kids in the pool. It’s open with more storage space than I need. It’s a wonderful space for entertaining" adds Georgie. Upstairs the extension creates a beautiful open plan master suite featuring one of Georgie's most favourite parts of the house, her office, and I can see why! "Our bedroom feels like a haven away from the rest of the house. It is light and airy with beautiful views of the canal." The beautiful porcelain wood effect tile continues throughout the two storey home and this continuity creates space and reaffirms the concept of open plan living. For example, bathroom tiling can often be a tricky consideration but the Loxton's have cleverly continued the wood-effect tiling into the doorless master shower, with a dip in the shower 'base' to assist with draining. The planning and design of these simple features makes for very effortless living. "Open, understated and welcoming" is how Georgie neatly describes their home and this is a wonderful, if slightly too modest, description. The home feels very spacious and warm, clutter free yet well dressed; contrasting sentiments that are tricky to combine without good design. The use of natural colours and white as the base colour throughout the home creates a clean, inviting environment that feels effortlessly nestled into the colourful Caribbean surroundings. The luscious mature garden and pool area create a colourful contrast to the white, natural tones and pops of turquoise create a fluid design throughout the home. "Our budget was blown out of the window, but not really through any fault of our own. There were existing issues with the building that we had we had to deal with but we didn’t know about them in advance". "We struggled with the challenge of not having things when we needed them due to shipping challenges!" "We moved out but didn’t appreciate that there would be nowhere to store things like our existing kitchen appliances, some of which we kept. They ended up sitting outside on our deck for months and caused me so much stress every time I went to the house (which was every day!). Also, we put lots of our belongings into one of the bedrooms that was supposed to stay untouched. But everything was touched and the dust was everywhere. If we did it again I would be far more organized and put everything in storage". "Our kitchen is my dream kitchen as I can cook whilst watching the kids in the pool!" 5. Keep calm and carry on! Special thanks to the Loxton family for sharing their wonderful story and beautiful home!.